Marlborough did put us on the world viticultural map; we just figure that sometimes the Hawke's Bay interpretations of our national grape get lost in the headrush of Marlborough's fame, and would, by offering up some rather fantastic examples, remind everyone that there is Sauvignon life north of Blenheim. 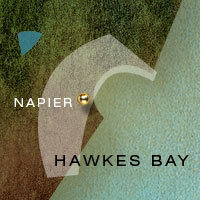 And, did you know that Chardonnay is the most widely-planted grape in Hawke's Bay, which tells you how seriously it is taken down in those parts. Production/volume is led, ever so slightly, by Marlborough, yet Hawke's Bay would be considered by most wine enthusiasts to be the region that consistently produces New Zealand's finest expressions of the Great White Grape, having in fact done so for some years. In a winemaking nation as young as ours, consistency and longevity count. Oh, did we mention the Reds? Smart ones they are.